What’s more, this stubborn moralizing impulse is what makes American political fiction, even today, such watery and unsatisfying literature: It deprives writers of the best material. Don’t the intrigues sprouting from our well-known human flaws and excesses ultimately make for more engaging plots and character studies than the falls from grace of a thousand or so Washington ingenus? You can consult any of the scores of wiser, better-written European novels of politics–Fyodor Dostoyevsky’s The Possessed, Ignazio Silone’s Bread and Wine, Stendhal’s The Charterhouse of Parma, Gunter Grass’s Dog Years, Joseph Roth’s The Spider’s Web, to name but a few–and see how much richer and more nuanced political fiction can be. He didn’t enjoy Thank You For Smoking, which I rather liked. But the point is well taken. Renaming states “Lincoln” and “The Delta” is kind of cool. But, of course, this map is acceptable only because it left Missouri alone. All year I’ve been waiting for Obama to flex his narrative muscles, to tell the story of his presidency, of his Administration, to tell the story of where our country is going and why we should help deliver it there. A coherent, accessible, compelling story—one that is narrow enough to be held in our minds and hearts and that nevertheless is roomy enough for us, the audience, to weave our own predilections, dreams, fears, experiences into its fabric. It should necessarily be a story eight years in duration, a story that no matter what our personal politics are will excite us enough to go out and reëlect the teller just so we can be there for the story’s end. But from where I sit our President has not even told a bad story; he, in my opinion, has told no story at all. But thankfully, in good conscience, I think he’s right. Ari Fleischer owns a sports communications firm. It’s called Ari Fleischer Communications. He is keeping us from having a college football playoff. 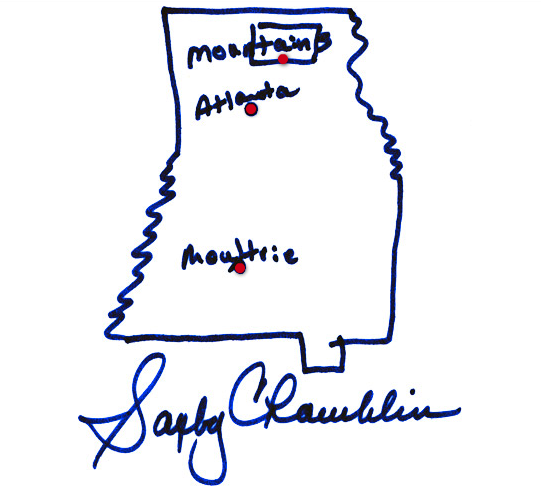 Ergo, Saxby Chambliss has no f-ing clue what his state looks like. More Senators draw their states, here. My Senator did an admirable job with the boot heel, but missed Northwest Missouri. It’s cooler than that screenshot makes it look. If you must read and look at more, I’d recommend Esquire on the art of the wall; George Packer on the wall’s replacement (gay clubs, among other things); Magnum Photos on East Germany well before the wall’s fall.